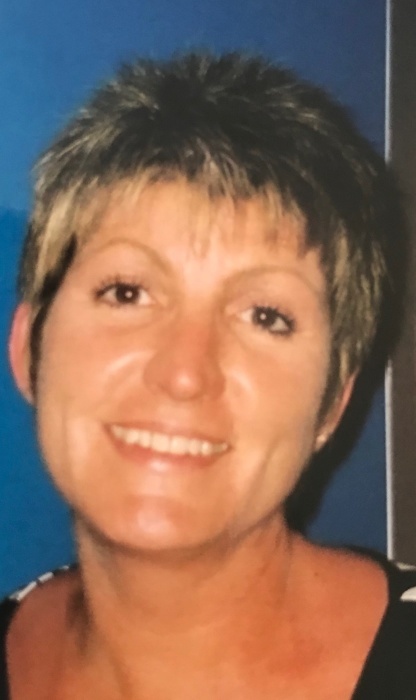 Jan Hollencamp age 58, passed away January 21, 2019 at Lakeland Medical Center in Elkhorn, WI. She was born on July 15, 1960, to the late Robert and Ann (Hollerbach) Jeskey. She was united in marriage to Craig Hollencamp in 1980. During her life she enjoyed water-skiing, playing Scrabble and doing puzzles, bird-watching, and more recently, spending time with her two beloved grandsons. Jan is survived by Craig and her daughter Cari (Ryan) McBurney, and she is the proud grandmother to Aidan and Preston McBurney. She is the sister of John (Phyllis) Jeskey and Robert Jeskey, and was preceded in death by her sister, Leslie Koldeway. Jan is the daughter-in-law of Rene and the late Charles Hollencamp, the sister-in-law of Dale Hollencamp, Tom (Wendy) Hollencamp and Kim (Bob) Movrich. She is an aunt to Jennifer (Lenny) Nelson, Kathleen O’Neill (Patrick), Michael (Katie) O’Neill, Andrea O’Donoghue, Ed Jeskey, John Jeskey, Nicole (Jesse) White, Katie (Jason) Dennis, Markus (Kayla) Movrich and Matt Movrich. She is further survived by 19 great-nieces and nephews. Her family and friends will hold her forever in their hearts. Private family services will be held. Memorials in her name can be made to the American Cancer Society P.O. Box 22478 Oklahoma City, OK, 73123. Online condolences: Haaselockwoodfhs.com. The Haase-Lockwood & Associates Funeral Home and Crematory of Twin Lakes, WI, is assisting the family. Our Funeral Homes proudly serve the communities of Wisconsin: Walworth: Elkhorn, East Troy, Lake Geneva, Walworth, Williams Bay, Fontana, Delavan, Darien, Sharon, Genoa City, Zenda, Pell Lake, Lyons, Whitewater, Little Prairie, Troy Center. Kenosha County: Kenosha, Bristol, Paddock Lake, Pleasant Prairie, Silver Lake, Somers, Twin Lakes, Brighton, Paris, Randall, Salem, Salem Lakes, Wheatland, Camp Lake, Lily Lake, Powers Lake, Wilmot, Trevor, Bassett, New Munster, Illinois: McHenry: Mchenry, Woodstock, Fox Lake, Johnsburg, Richmond, Spring Grove.